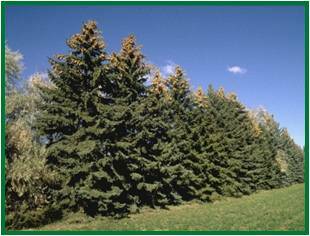 Colorado Blue Spruce is a large specimen evergreen tree that matures at 50 feet with a spread of 20 feet. It has an upright pyramidal growth habit with a slow growth rate. The Colorado Blue Spruce prefers to be planted in a full sun location, but will tolerate partial shade in moist, acidic, well drained soil locations. It can tolerate a drier location as well as salt spray. By habit, Colorado Blue Spruce tends to grow fairly dense and pruning once a season insures dense growth. Picea is derived from the Latin word “pix” or “pitch” referring to the resin contained in its bark. Pungens translates as sharp pointed, referring to the needles and Glauca translates as glaucous, referring to the bluish colored needles of most cultivars. Colorado Blue Spruce is commonly used in the landscape as a specimen tree, but also makes a great evergreen screen for privacy or a windbreak. Although this specimen is quite drought tolerant, when newly transplanted, it needs at least one year of a routine watering schedule to re-establish the roots. If not watered regularly, it can result in death of the terminal leader, dieback of side branch tips or death of the entire tree. 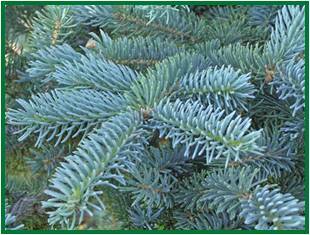 If you’re looking for a specimen evergreen with color or a great screen or windbreak that is salt tolerant, Stratham Circle Nursery recommends the Colorado Blue Spruce.